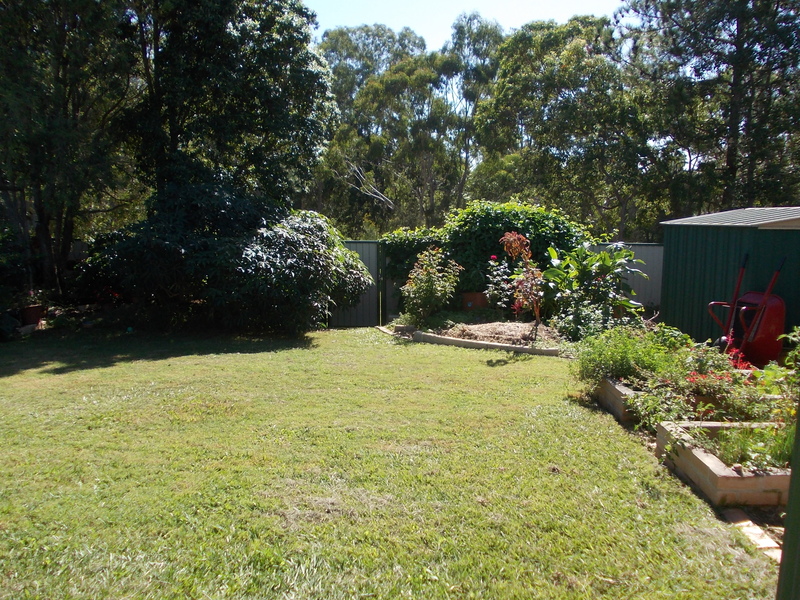 We bought our current house-in-the-‘burbs in September 2011, and it was basically a clean-slate garden-wise when we bought it; the only features being 3 mature lemon myrtle trees (Backhousia citriodora) and 2 red-flowering bottlebrushes (Callistemon spp) along the back/northern fence, 3 mature pink-flowering callistemon along the eastern fence, a mature lemon tree (possibly a Meyer) and a small mandarin against the western fence, a tin shed in the north-eastern corner of the yard, a watertank near the northern corner of the house, a few neglected rose bushes near the shed and under the bedroom window, a few oleander and azalea bushes and agapanthus out the front, and a very well-trimmed hedge along the front of the house. The rest was grass. Lots of grass. 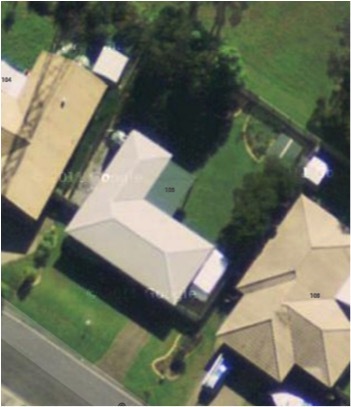 I did actually take quite a few ‘before’ photos before we moved in and started changing things, but I haven’t been able to locate them, so here is a photo from GoogleMaps instead, which from my guess is at least 5yrs old because the neighbours had solar panels for about a year before we moved in and they’re not pictured here. 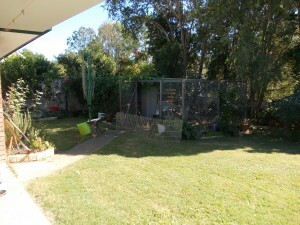 As we had already had chooks (4 Australorps) for a few years before buying this house, the very first task was to install some secure housing for them (we’d lived in this suburb previously, over the other side, and knew that there were foxes around, and the existing fence had some rather large holes in it at that point). 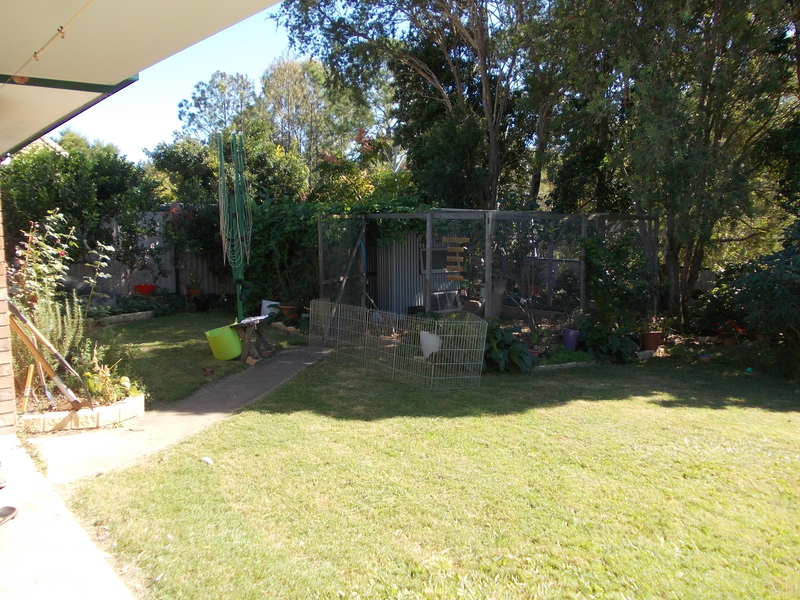 The structure I’d designed consisted of a brick base, with 3 layers of bricks (‘seconds’ bought on sale direct from the local Austral brickworks) below ground to ward off digging animals, and a reclaimed hardwood timber and aviary wire (chicken wire is too soft and sags quickly under its own weight) structure above, all coming to approximately 4m x 6m and 2m high (it quickly acquired the names of ‘Chook Mahal’ and ‘Taj MaChookHouse’ from family members). As this was obviously not going to be built overnight, my chooks went on loan to a friend who was trying to convince her husband to get some (he quickly fell in love with their little book-book sounds and a few months later, they had their own flock of Wyandottes). Win-win! More of those ‘first tasks’ included installing 5 raised vegie beds (with the same seconds bricks that we used for the chook run) in the sunny north-eastern side of the yard, trimming the tops off the eastern callistemons, because they were shading the neighbours solar panels (and I knew that would annoy me, if I was them), installing our own solar panels (3kW this time, the most we could fit on the northeast-facing roof, which actually cost less than the 1.5kW system that we had on our last place) and summarily removing the oleanders from the front yard (I cannot, for the life of me, understand why people put something so toxic in a suburban yard when children and animals will come in contact with it!). After that, the rest of the improvements just chugged along progressively and I’d have to look up in my garden diary when most of them actually happened. 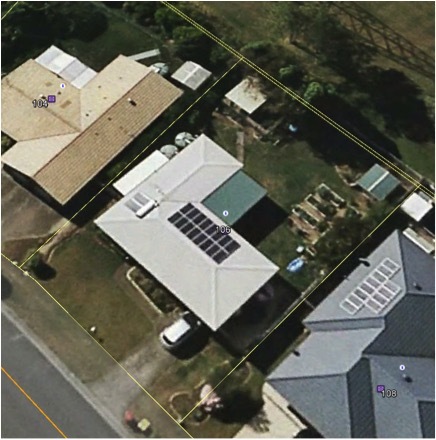 I do know, however, that we reno’ed the front yard during the Easter holidays in 2014, so I can pin point the age of this GoogleEarth photo (below) as being after we’d done the above ‘first tasks’, installed the salvaged roof over half of the chook run, installed the second watertank and solar hot water, built the lean-to down the side of the house (a bit of passive temperature control by shading the western-facing brick wall of the house) and added the herb and flower bed to the southern end of the vegie patch, but before the front yard was done at Easter, The Little Blue Van was purchased in July (usually parked down the eastern side of the house), the pizza oven was built in November and the patio roof was upgraded in December (all in 2014). 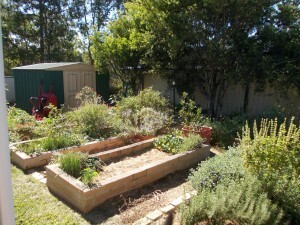 My usual state of ‘mess’, with herbs and flowers tucked in around the vegies, and I hadn’t bothered replanting that front bed as I was about to leave for my Permaculture Course. 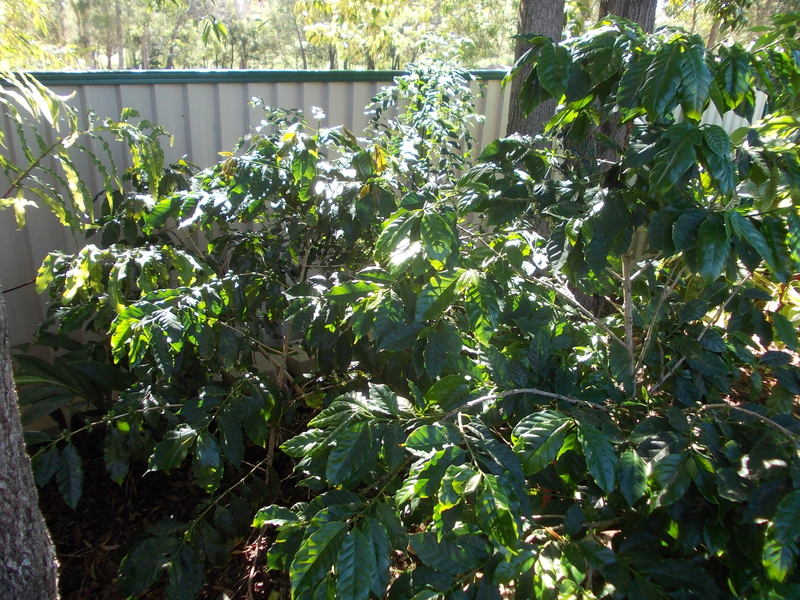 Zooming in, in between the cassava and the chook run is the ‘coffee plantation’, consisting of 3 coffee trees (Coffea arabica) and a sweet leaf (Sauropus androgynus). 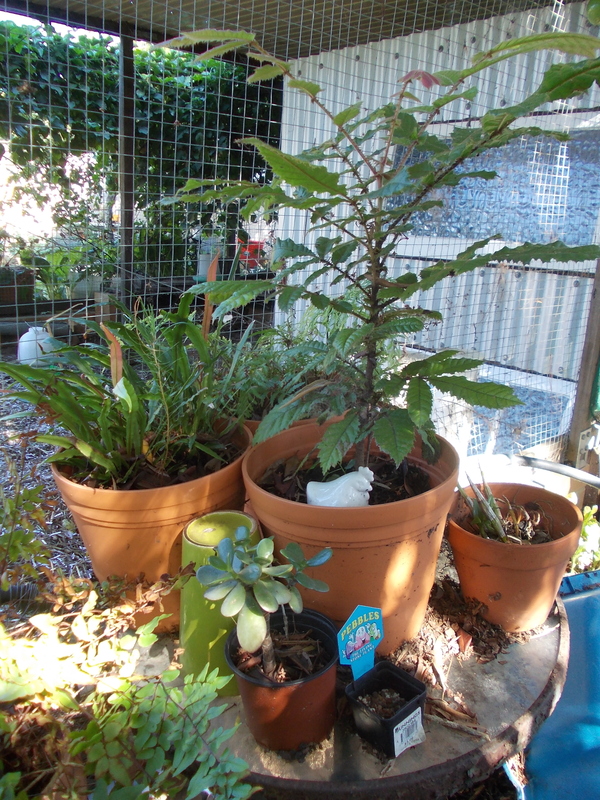 (UPDATE Jan 2016: we’ve since added to this area a jabotacaba (Myrciaria cauliflora) and two lines of chillis along the southern edge and are waiting for another 3 coffee seedlings to get big enough to plant out, phasing out the cassava). 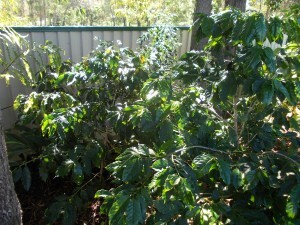 The closest coffee is actually a dwarf variety that we transplanted from our previous place when we moved. The other two are standard-sized coffee trees so they’ll probably need to be top-pruned at some point so the harvest stays within reach. 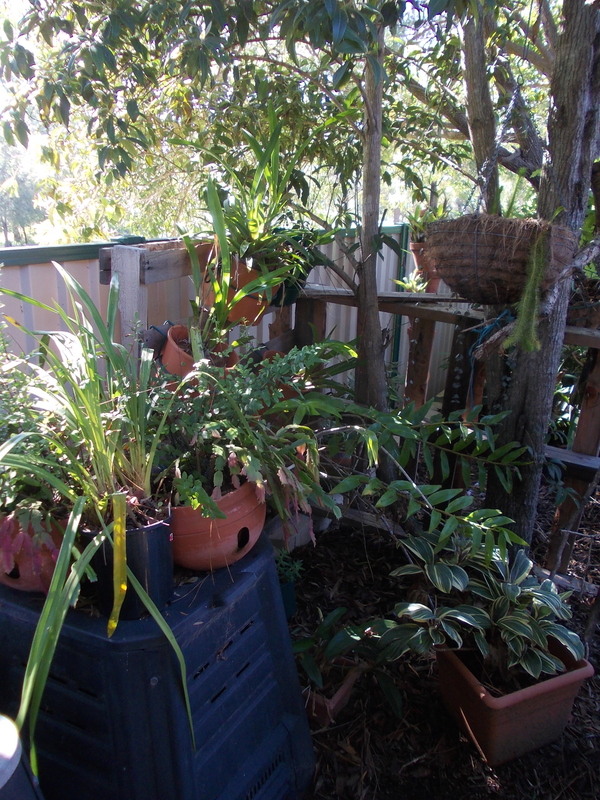 Along behind the chook run, under the shade of the lemon myrtles and red-flowering callistemons, is a shady area where I keep my collection of hand-me-down orchids, bromeliads and ferns hanging from a couple of reclaimed shipping pallets and sitting atop an unused (at this time) compost bin. A glass-top patio table serves as a home to more ferns and a Davidson Plum in a self-watering pot. 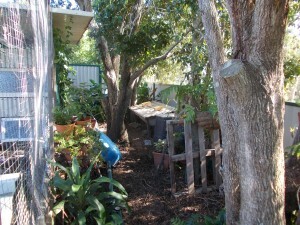 Towards the back you can also see the first of (now) two bathtub worm farms. 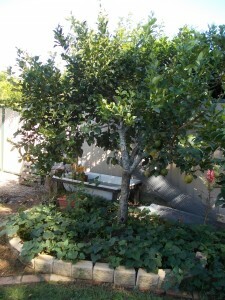 Behind the lemon you can see another bathtub (my husband jokes that we have more bathtubs in the garden than in the house, but given that we don’t have a bath in the house, that isn’t difficult!). This one is for water vegies and herbs, including kang kong, pickeral rush, watercress, spearmint, vietnamese mint and pennyroyal (and mozzie control in the form of guppies and native blue eyes, white clouds and rainbow fish). 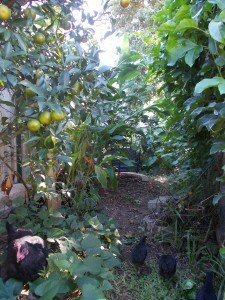 The birds also seem to like bathing in there. Along the southern side of the chook run is ‘the berry patch’, with (from left to right) a thornless blackberry and a loganberry in the white tub (one half of a salvaged water drum), two Biloxi blueberry bushes (a low-chill variety that grows quite well here in Brisbane) and strawberries (not pictured) in the other half of the water drum, all inter-planted with comfrey. 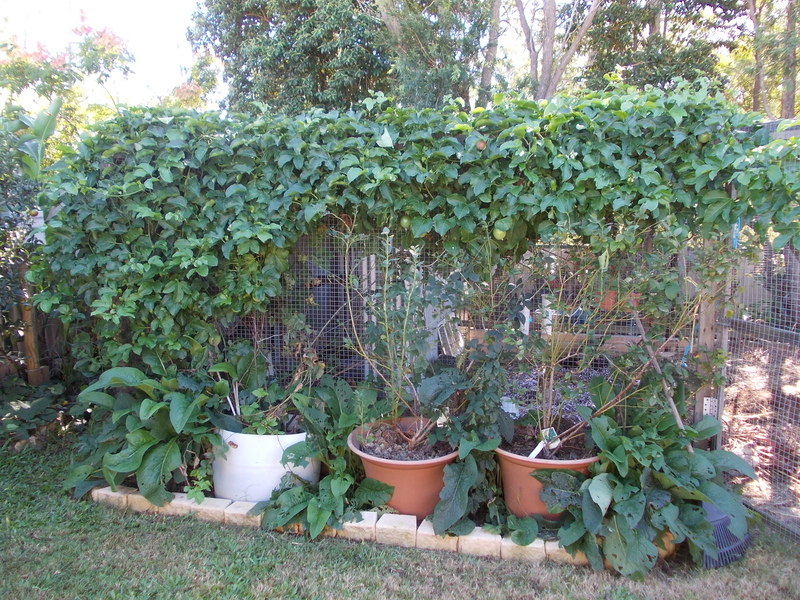 The blackberry and loganberry also grow up and over the chook run (so the chook run walls act as both chook containment and security, and climbing frames). 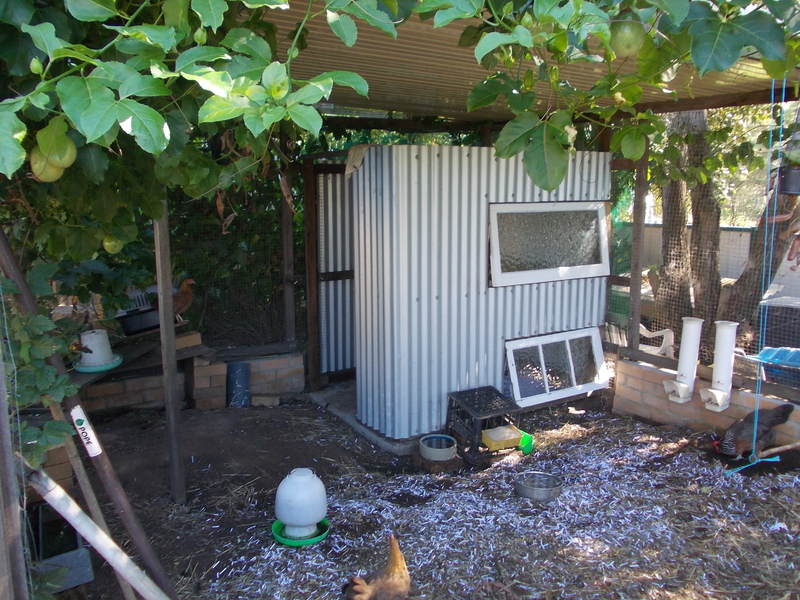 Inside the chook run is the chook house. All the hardwood used in the construction came from a salvage yard, as did the two windows. Inside, are two nest boxes and two roosts, and the gap at the top allows for good ventilation in summer. The tin had to be bought new, as the only salvaged sheets I could find at the time were full of rust holes and therefore not weather-proof. The roof above is the salvaged patio roof from my parents’ place. 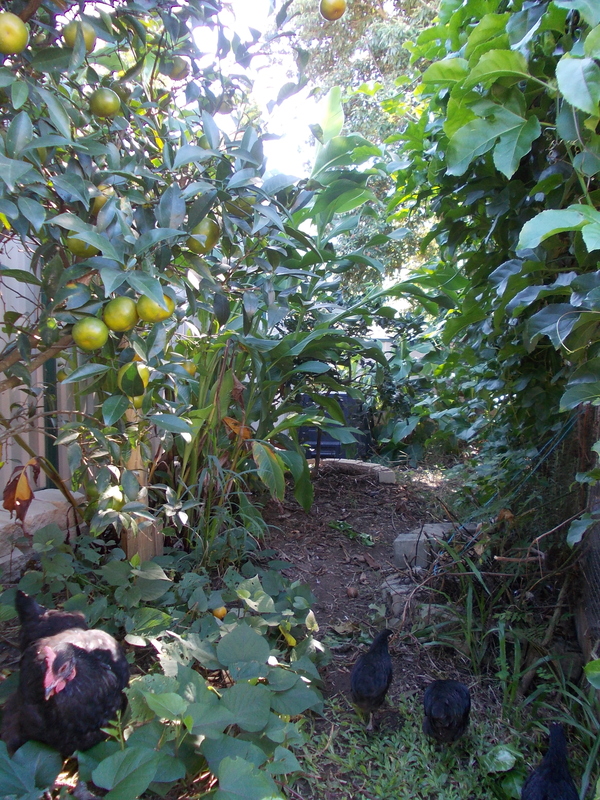 In this photo, the chooks standing on the bench at the back, and the one in the centre foreground are Old English Game Bantams, while the chook to the right of the picture is a Silver-wing Dorking, an endangered breed in Australia. Amongst the passionfruit, hanging from the roof, are also two pitcher plants (Nepenthes spp), and to the right of the photo, is the swing that I made the girls from a stick and pieces of blue hay-bale twine. It’s a work in progress, but it’s getting there, and I’m always trying out new things so it’s an endless source of learning for me. ‘Myrtle Farm’ only really came into actuality recently, but the name had been bantered around, jokingly, for a year or so, mostly when referring to the marmalade, eggs and other produce that I used to share with friends and family. 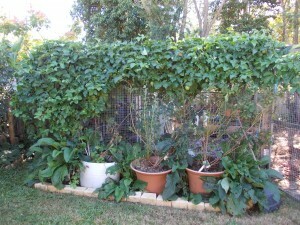 Before then, it was just ‘Kimmy’s garden’, ‘Kimmy’s chookies’ or ‘Kimmy’s eggs’.